This 15-day deluxe tour takes you to Guatemala's highlights in style, guaranteeing top quality of transportation, accommodation and guidance while seeing this beautifully varied country. 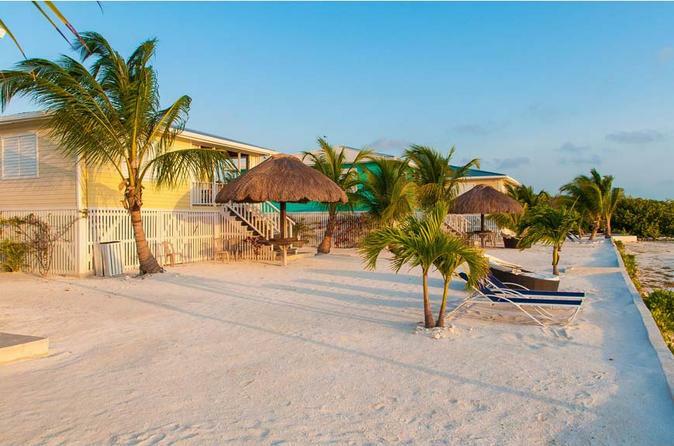 Halfway in, you will visit the Cayes in Belize, where you will be able to experience ultimate relaxation and comfort. Once well rested, you will be taken back to Guatemala to hike a beautiful active volcano with magnificent views of flowing lava, and experience more of the interesting culture in the colonial town of Antigua, as well as in Panajachel, a village on 'one of the most beautiful lakes in the world' lake Atitlan. Lastly, the market in Chichicastenango will offer you time to see Mayan descendents at work, weaving colourful souvenirs for you to take home as a memory of your trip of a lifetime! Day 1: You will be taken to your hotel in Guatemala city in a private taxi. 1 night of accommodation in luxurious hotel, double room with private bathroom, breakfast included. Day 2: A private taxi takes you to Guatemala City airport, from where a domestic flight brings you to Santa Elena, Peten. You will be taken on a private tour around the Mayan ruins of Tikal. Bilingual guide, round trip transportation, lunch, bottled water and entrance fees are included. You'll be taken to your exclusive hotel where you'll enjoy 2 nights of accommodation in a luxury double room. Day 3: In the morning you'll be picked up at your accommodation and the private transportation will take you to the lesser known Yaxha archaeological site, where you have a private tour with bilingual guide. Lunch, water and entrance fees included. Day 4: Private transportation will take you from your hotel to the airport of Flores, where you'll board a flight to Belize City. A private driver will be awaiting you, to take you to the docks from where you take the ferry yourself to Caye Caulker (tickets not included). Here you stay for 4 nights in a beachfront resort, in a nice hot tub cabaña. Day 5, 6 and 7: Free days at the resort where you'll - apart from relaxing - be able to partake in watersports such as snorkeling on the beautiful second largest barrier reef in the world. Day 8: You will take the ferry back to Belize City (tickets not included), where a driver will be ready to take you to Belize City airport. From there you'll take a flight to Guatemala City. Once there, a private driver will take you to your hotel in the colonial town of Antigua. Here, you'll spend 4 nights in a luxury hotel in the city centre. Day 9: A private driver will pick you up at the hotel, to take you to volcano Pacaya. This volcano is active and hiking this icon is unforgettable. Here you can explore the area around the crater, hear the eruptions and toast marshmellows where the lava is still hot! The biligual guide will take you up the volcano to guarantee a safe trip. Entrance fees are included. After this great experience, the driver brings you back to your hotel. Day 10 and 11: Free days in Antigua. Day 12: A private minivan will take you from your hotel to a luxury hotel in Panajachel, located on beautiful volcano surrounded Lake Atitlan. In this hotel you'll enjoy 3 nights, breakfast included. Day 13: In the morning a private driver will take you to the colourful market of Chichicastenango, where you'll enjoy a private tour with a bilingual guide around the market, a church, a Mayan altar and a traditional mask production. Drinks and food are not included, but the guide can take you to the best places to taste the local cuisine if desired. At the end of the tour, you'll be taken back to your hotel in Panajachel. Day 14: Free day in Panajachel. Day 15: A private driver will take you from your hotel to Guatemala City airport.